Home Real Estate For Buyers First Time Home Buyers How Does Housing Help Build Family Wealth? For example, let’s assume a young couple purchased and closed on a $250,000 home in January. What will that home be worth five years down the road? Pulsenomics surveys a nationwide panel of over one hundred economists, real estate experts and investment & market strategists every quarter. They ask them to project how residential prices will appreciate over the next five years. 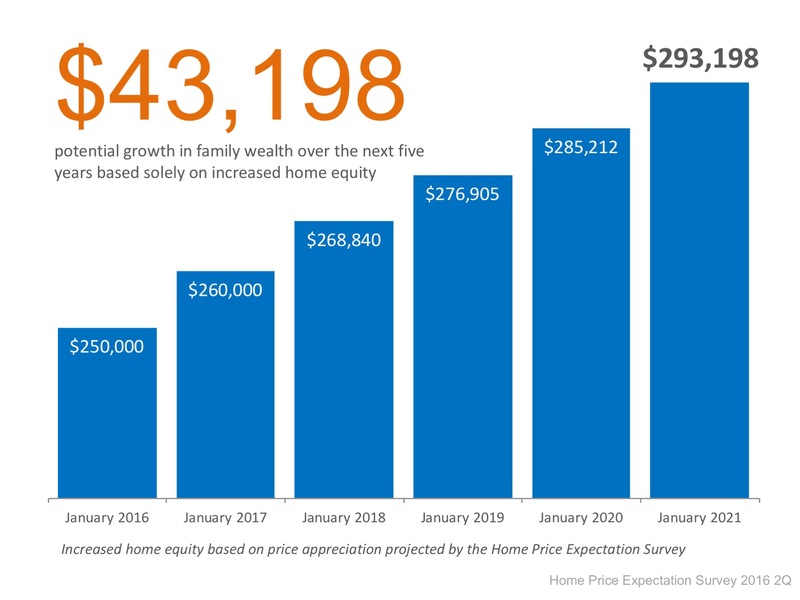 According to their latest survey, here is how much value that $250,000 house will gain in the coming years. Over a five-year period, that homeowner can build their home equity to over $40,000. And, in many cases, home equity is large portion of a family’s overall net worth. The previous example is based solely on expected real estate market “appreciation” (increase in value). This strategy is nothing more than paying a mortgage, keeping up with necessary repairs, and waiting. I want to dig a little deeper and broaden the possibilities. Two other notable ways to get appreciation are “Found” and “Forced” appreciation. You find and purchase a home (or other real estate) at a discount price. You bought it on sale! Even if you do nothing to it, there is still much more value than you paid for it. A good example is a foreclosure. It’s becoming harder to find a great deal in today’s market, but they still exist. Much of what you see on that popular TV channel is forced appreciation. You take a clunker, clean it up, and sell it later for a profit. You can force appreciation while living in a property over several years, if you’d like. A coat of paint here, some new landscaping there, and you can build some major equity very quickly and affordably. One more consideration is to take an investment approach, specifically focused on generating a monthly cash-flow. You can rent out some or all of a home. You can do that with several homes. You can buy apartment buildings, even shopping malls! These investments can be transferred, legally, with no fuss. This strategy can produce ongoing, long-term, true family wealth. If you are looking to better your family’s long-term financial situation, buying your dream home is a great option to start with, and real estate is a great path to family wealth. Ready to make it happen, or learn more? Contact me today!